Agility is vital to modern biopharma marketing teams. To raise brand awareness in a competitive industry, teams need to quickly roll out websites, mobile applications and sales tools. The cloud is ideally suited to these tasks. 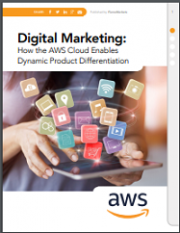 Adopters of the cloud are now realizing it is also the foundation of a more dynamic, interactive form of marketing that uses real-time information and feedback loops to tailor messaging and ultimately improve health outcomes. This is the next frontier in digital marketing. The amount of data available to marketeers is only going to increase. With cloud computing capacity growing all the time and machine learning tools coming online, marketeers’ ability to quickly and easily ask questions of the data will also increase. These are the tools now available to marketeers. Equipped with them, companies will innovate to continually refine how they engage with patients and providers and, ultimately, improve health outcomes. Your information will be handled in accordance with the AWS Privacy Notice.